Dogs have been our muses, our mentors, and our playful and noble co-pilots. They’ve had a profound influence on us as healers and spiritual guides, and also as co-workers, helping to guide, hunt, herd, search, and rescue. Our bond with dogs is deep and unbreakable, and there’s no better source a reader can turn to for a richer understanding of that complex and wonderful relationship than The Bark. The Bark began as a newsletter in Berkeley, California, that advocated for an off-leash area where dogs could cavort and play. Within a few years it had become a full-fledged, award-winning glossy magazine that published work by some of the best writers in America today. And as it grew, the magazine embraced a much larger canvas: to cover the emerging phenomenon of “dog culture” that has been developing over the past decade, as dogs have moved out of the backyard and into our homes, communities, and, indeed, the very center of our lives. As editor Claudia Kawczynska writes, “The implications of integrating another species into society’s daily fabric go well beyond how we nurture our dogs. It calls for a revamping of the standard etiquette—respecting the concerns and interests of society at large. This new relationship, along with an appreciation for our rich and unbounded future, comprises what we call dog culture. This is what The Bark set out to chronicle.” Dog Is My Co-Pilot is an anthology of essays, short stories, and expert commentaries that explores every aspect of our life with dogs. Fifty percent of the material here has never been published before. The book is divided into four sections: Beginnings explores that first meeting, “the initial murmurings when a dog-human relationship is formed.” Pack investigates the theme of “togetherness” and pays tribute to the dynamic of multiple personalities in the canine-human relationship. Lessons examines what dogs teach us, from love to enlightenment. The final section, Passages, reflects on the themes of true friendship, transformation, and loss. Included are pieces by Lynda Barry, Rick Bass, Maeve Brennan, Margaret Cho, Carolyn Chute, Alice Elliott Dark, Lama Surya Das, Pam Houston, Erica Jong, Tom Junod, Caroline Knapp, Donald McCaig, Nasdijj, Ann Patchett, Michael Paterniti, Charles Siebert, Alexandra Styron, Elizabeth Marshall Thomas, and Alice Walker. In selections that are humorous, poignant, truthful, sometimes surprising, and frequently uplifting, Dog Is My Co-Pilot embraces the full experience of the world’s oldest friendship. 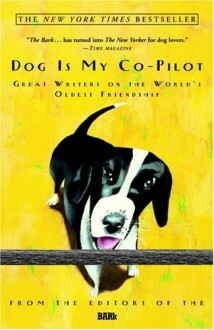 For people who love great writing and, yes, great dogs, it’s a book to be both shared and treasured.